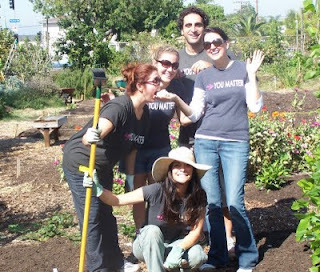 Every Monday Matters volunteers showed up (on a Thursday!) and worked very hard in the Garden. These hardworking volunteers are clowning around with an unplanted bulb of garlic. Such volunteers bless and uplift our project and many others through their light hearted humor and joyful hard work. The work they did in The Learning Garden this morning would have take the Gardenmaster about a week to have finished. Gosh!